Ankle sprains can be serious and should be given immediate attention and care, despite not being as severe as a broken ankle. An ankle sprain can lead to a significant amount of pain, as well as limited mobility. They are often characterized by swelling and discoloration of the skin, which occurs when the ligaments are stretched beyond their limits. The simple act of walking can sometimes cause a sprain, which makes them a very common injury for anyone. They occur when the ankle twists in an awkward way or rolls over itself, causing a pop or snap in the tendons around the ankle. Some people are more at risk than others, including athletes who continually push their bodies to the limits and also people who have previously suffered accidents to the feet, ankles, or lower legs. If you believe you have an ankle sprain, it is important to consult with your podiatrist right away. 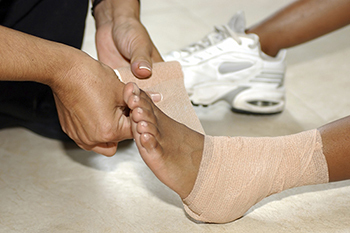 Ankle sprains can turn into severe injuries that may require hospitalization. If the ankle ligaments or muscles are damaged from a tear or rip, the sprain may be severe enough to warrant going to the hospital and possibly having surgery done. Even after surgery the recovery process can be long, often involving rehabilitation sessions with a podiatrist to get your ankle back to full strength and health. The severity of your sprain may become apparent if you are unable to stand or walk, if non-stop pain is occurring over a prolonged period of time, if swelling is much more severe than initially present, or if you start to experience tingling or numbness. These signs may show that your ankle sprain might actually be a broken ankle, which requires immediate medical attention. While not completely avoidable, ankle sprains can be curbed with some preventative treatment measures. These include wearing appropriate fitting shoes that not only provide a comfortable fit, but also ankle support. It is also recommended to stretch before doing any kind of physical activity, as this will help lower your body’s chance for an injury.